I stood in line trying not to stare. In front of me, a woman was talking to one of my personal idols. Luckily my heart was pounding hard enough that I could not hear what she was saying. So I walked up to Terry Matlen, introduced myself, and told her how happy I was to see her in person. Wanna know what happened next?! She hugged me! Terry Matlen hugged me and told me that she loved my work. I stammered, “well I love your work.” We might have said a few more words to each other, not sure. In that moment I realized that what I do matters. This interaction was just one of so many that showed me that I have found my people. 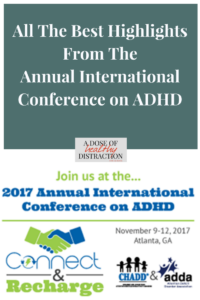 The annual conference on ADHD is not just about listening to doctors and therapist talk about ADHD. It’s about finding your tribe. I went to Atlanta worried that nobody would be interested in my website and my desire to support women with ADHD. Do I even deserve to be here? I’m not a counselor, and I have no letters behind my name. There is a place for me here with all of these accomplished, amazing people because they are MY people. After listening to the keynote from Dr Adam Gazzaley, which was very well-done, I rushed to get a seat for Russell Barkley, PhD. 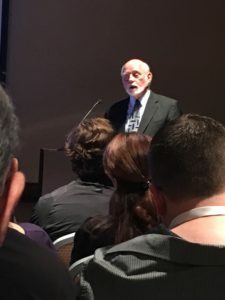 I have expressed my admiration for Dr. Barkley before so I really wanted to hear him talk about slow cognitive tempo (SCT). I will write a whole post about this later so I won’t go into the details here. But I will say that as a person who is mainly inattentive, the information was quite useful. Oh and here is one of my crazy fangirl pics to prove I was there. Here is a link to Dr. Barkley’s website. My Next stop was James Greenblatt, MD. As someone who has struggled with body image for years, it was good to hear to explanation of the neurochemical imbalances and reward-system regions of the brain that are at play with eating disorders. As it turns out, girls diagnosed with ADHD in childhood are at risk for self-reported disordered eating behaviors and body image dissatisfaction, and 3.6 times more likely to meet the criteria for an eating disorder. I was given a copy of Dr. Greenblatt’s new book which I will review in the near future. Here is a link to Dr. Greenblatt’s website. Immediately after hearing Dr. Greenblatt speak I moved to hear Roberto Olivardia, PhD speak about obesity risk factors when you have ADHD. Dr. Olivardia explained the association between ADHD and obesity, and elaborated on some of the neurological issues that predispose the ADHD population to weight gain. At the end of the day I got to see James Ochoa, MEd, LPC. I was particularly excited for this because I very much enjoyed his book. Below is my affiliate link. Please read my full disclosure policy. In this amazing session, I learned how emotional distress syndrome develops and some techniques for handling it. As a group, we also participated in what Mr. Ochoa calls a, “micro meditation.” I cannot wait to share this with my group members! James is a big believer in using our imagination to heal ourselves, and I find his work totally fascinating! The opening keynote on November 11th was given by Matthew Cohen, JD and addressed disability law. Thank goodness I went to both this, and his session afterward. I learned so much about my rights as a parent of a child with a disability. Free and appropriate education is a very nuanced term, and it’s important that we know how to advocate for our children. In my case, I plan to push for an IEP going forward so that I can include some of the language he discussed during the session. Because I am not a coach (yet) I wanted to learn a little about the coaching process. Alan Graham, PhD, PCC, MCAC taught an enlightened lesson and then allowed us to take turns practicing some specific coaching techniques. In short, I learned how to explore and amplify a person’s strengths, and then how to start motivating them toward change. Obviously, I will still need to get the coaching designation, but it was certainly a learning experience for me. Most members of my group know that I am a fan of Terry Matlen, MSW. She is the author of The Queen of Distraction. Please see my full disclosure about affiliate links. Ms. Matlen posted a list of the major areas of our lives and then led us in a discussion of how ADHD affects them. She invited stories from women in the session, and it created a really warm and comforting environment. I found myself wishing I could afford one of her private groups so I can work with her more closely. At the end I worked up my courage and introduced myself, and as you read above, Terry was awesome! I hope I get to work with her in some way in the future. My very last session with with Diane Dempster and Elaine Taylor Klaus from ImpactADHD. In this session we discussed why are parents we tend to yell, and how we can better identify the things that trigger us. Then we had a discussion about the common triggers for parents. There were a few AHA moments in this session for me. One of which was my tendency to catastrophize about the future. In the end, I was really impressed with their approach to parent training and I plan to promote their programs more in the future. Here is my affiliate link for Impact ADHD. For this year’s Black Friday Special parents will be able to get Sanity School™ for only $97 — from Nov 24-28, 2017. That is a 60% discount! Please see my full disclosure. Overall I am 100% positive that my decision to go to the Annual Conference on ADHD was the right one. I met amazing people, MY PEOPLE. For the first time in a long time I feel confident in my competence and my place in the ADHD world. I will certainly plan to attend next year. If you are an adult living with ADHD, the parent of a child with ADHD, or the partner of someone living with ADHD I highly recommend this event.